The toddler years are a time of rapid growth and development. Between the ages of 1-3 years your toddler is still growing faster than any other time of life. Growth at this speed will never be repeated again in your toddler’s life! On average toddlers gain about 2.5kg (5 pounds) and grow about 12cm (4 inches) in length between the ages of 1-2 years. Until they’re three years old, toddlers will grow almost 1 cm a month on average! *By two years of age a healthy toddler is estimated to be approximately half his or her adult height. 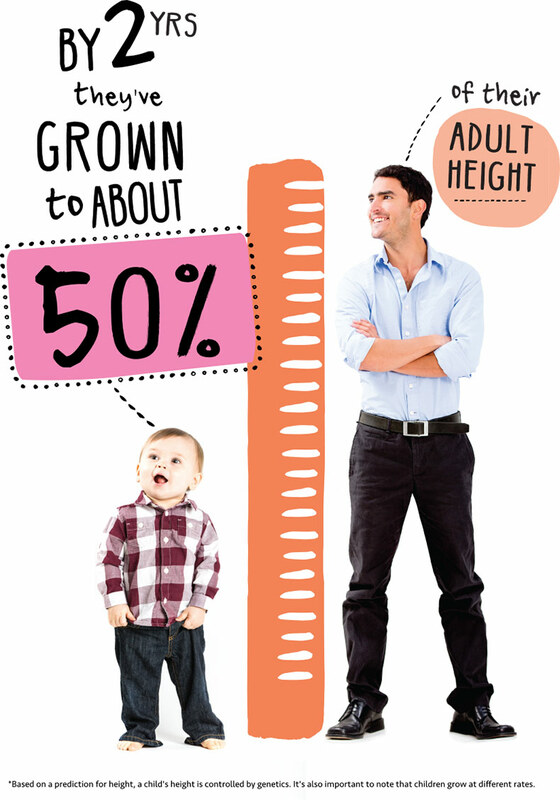 On average toddlers of tall parents tend to be taller than others that are the same age. Good nutrition is particularly important during the toddler years to fuel this period of rapid growth and development. Adequate intake of both macronutrients (carbohydrate, protein and fat) and micronutrients (vitamins and minerals) are essential to ensure optimal growth and development during the toddler years.